Sea otters have voracious appetites, and for good reason. As the smallest marine mammals, they face unprecedented metabolic challenges just to stay warm, consuming a quarter of their own body mass each day. And there are times when the metabolic demands of sea otter females rocket even further. Nicole Thometz, from the University of California at Santa Cruz, USA, explains that in addition to the extra cost of lactation, the mums must also expend additional energy while foraging to sustain themselves and their dependents. 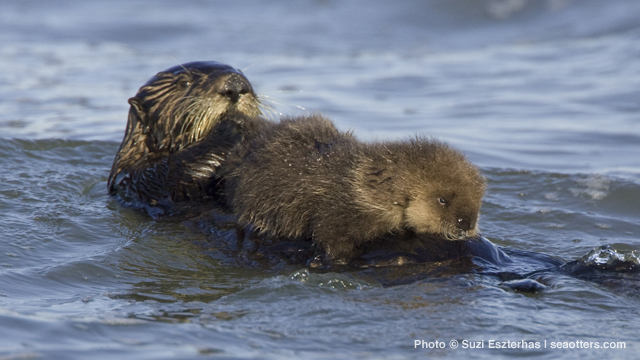 However, no one knew the true magnitude of the metabolic burden placed on sea otter mothers: ‘neither the energetic demands of immature sea otters nor the cost of lactation for adult females have been quantified’, says Thometz. Fortunately, Thometz and her colleagues had access to the world’s most successful sea otter pup rehabilitation program at the Monterey Bay Aquarium in California, where they could measure the metabolic rates of wild sea otter pups while they grew, prior to their return to the ocean, to begin to find out how much of a burden motherhood is for sea otter females (p. 2053). Measuring the metabolic rates of sea otter youngsters (ranging from tiny pre-moult pups to juveniles) as they participated in a range of activities from resting to swimming and foraging, the team discovered that their daily metabolic demands rose from 2.29 MJ day−1 during the first few weeks after birth to 7.41 MJ day−1 when the youngsters were about to begin foraging for themselves; even when the animals were beginning to fend for themselves they continued returning to mum to supplement their diet. It is only after weaning at 6 months that the mothers are truly free of their obligation. Tallying up the metabolic data, the team calculated that to supply a pup with a staggering total of 930 MJ of energy through to independence, the female’s daily metabolic rate has to escalate by an extraordinary 96%. And when the team converted this colossal energy expenditure into the amount of energy reserves that a sea otter female would use if unable to increase foraging, they realised that she would consume almost 133% of her own body mass. The only way that sea otters have to make up this gigantic metabolic shortfall is to increase foraging at a time when they are already running near their metabolic limits, stretching an even tighter energy budget still further. The team suspects that this extreme exertion could account for the poor condition of many sea otter mums and their relatively high mortality rates at the end of lactation. It could also account for the relatively high numbers of abandoned pups. Thometz says, ‘Female sea otters are thought to utilize a “bet-hedging” strategy, either keeping or abandoning a pup post-partum [after birth] depending upon physiological factors.’ She explains that females that are in poor condition and unlikely to be able to provide for their young are more likely to abandon their pups after birth to give themselves a better chance of successfully raising a pup during the following breeding attempt. ‘The optimal decision may be to “cut losses”’, says Thometz. And she adds that sea otter mothers may also choose to wean their young sooner to preserve their health, rather than risk their own survival and subsequent breeding attempts by investing too heavily in the present pup, although this strategy places youngsters that were weaned early at a greater risk of mortality after independence. © 2014. Published by The Company of Biologists Ltd. Article reproduced/adapted with permission from Journal of Experimental Biology. Thometz, N. M., Tinker, M. T., Staedler, M. M., Mayer, K. A. and Williams, T. M. (2014). Energetic demands of immature sea otters from birth to weaning: implications for maternal costs, reproductive behavior and population-level trends. J. Exp. Biol. 217, 2053-2061. Want to watch cute sea otters romp, wrestle and play every day of the year? Tune into our LIVE Sea Otter Cam for your daily dose of sea otter cuteness. If you come across a sea otter you think is sick, injured or abandoned, please give it space and call The Marine Mammal Center’s stranding hotline at (415) 289-7325. Here are some viewing tips to help you enjoy watching sea otters and other marine wildlife in a safe and responsible way. Did you know sea otters have built in pouches of loose skin under their forearms to stash extra prey when diving? Learn more about these cute and charismatic critters.